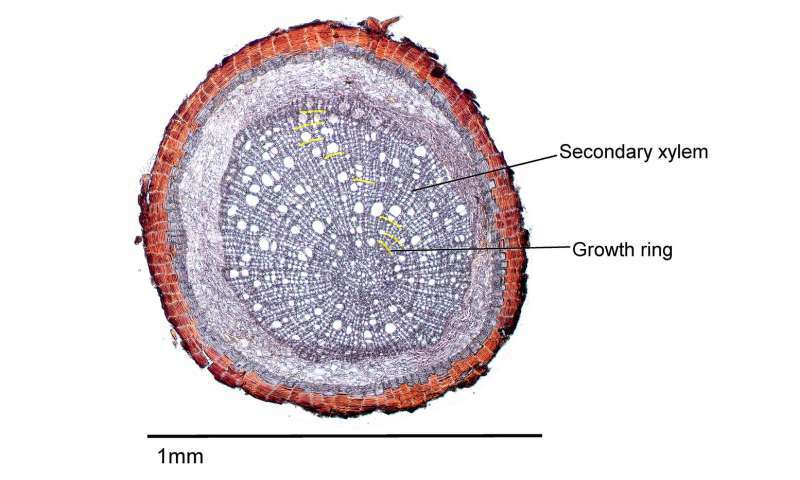 The researchers at the Swiss Federal Research Institute WSL used thin sections of roots less than two millimetres thick to identify the tree rings of several hundred spruce (Picea abies), pine (Pinus sylvestris), beech (Fagus sylvatica) and dwarf birch (Betula nana) roots. This approach enabled them to determine the age of the fine roots taken from trees in Switzerland, Germany, Sweden and Russia. The researchers used both tree ring analysis and radiocarbon dating to establish the age of the roots. The type of carbon used for the measurements, 14C, pinpoints the time at which the carbon that is the main component of the roots passed from the atmosphere to the plants by means of photosynthesis. Until now, very little was known about how quickly fine roots grow, when they die and how they react to environmental stress, such as drought. Radiocarbon dating estimated the roots to be around ten years older, on average, than the age indicated by tree ring analysis. "Based on this result, we concluded that trees use relatively old carbon for the growth of their young roots," says study leader Emily Solly. 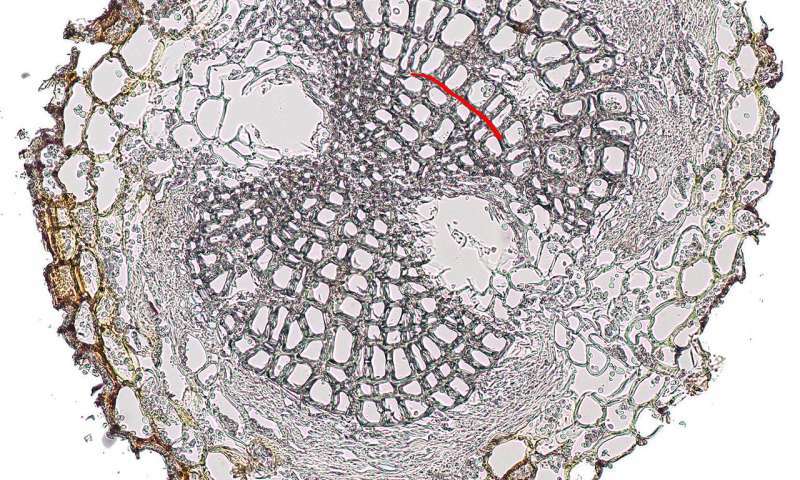 This means that the carbon taken up during photosynthesis is not used immediately for root growth, but is stored in the trees' trunks before being invested in root growth at a later date. "This strategy could be vital for trees," explains co-author Ivano Brunner: if trees store carbon, then in dry years, they can draw on these carbon reserves to form the fine roots that are so important for their survival. The researchers observed thinner tree rings and greater ages in some roots, especially fine birch roots taken from trees growing in the Russian Subartic region, which are subject to considerable environmental stress because of the harsh climate. "We attribute this to the extremely short summer growth period," concludes Solly. Roots play a crucial role in the life of trees. Trees take up water and nutrients through their finest roots, and dying roots contribute to the formation of humus in the soil. Roots therefore make a major contribution to forests' water, carbon and nutrient cycles. However, the lives of tree roots are shrouded in mystery. While the development of leaves can be observed closely and their metabolism can be measured accurately, the scientific community still knows relatively little about roots.